This is a different way of using pumpkin for this time of year; it is a fulfilling salad or side-dish. We have adapted the recipe to veggies that we produce. Cut the pumpkin into quarts. Peel and with the help of a spoon remove the seeds. Cut each quart into bite size pieces. Set aside. In a large bowl mix the olive oil, balsamic vinegar, coriander, thyme, salt and pepper. Add the pumpkin and toss well to coat. Transfer to a greased baking sheet and distribute butter cubes. Roast in the oven for 30 minutes, and turn them around every 10 minutes, until tender with a lightly toasted crust. 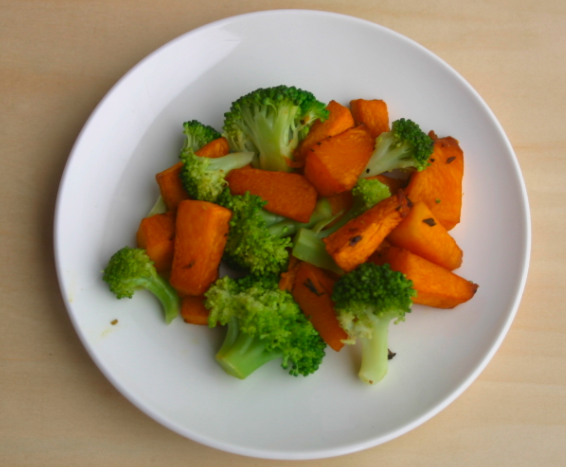 Cut the broccoli florets and blanch them, drain and transfer them to a platter, add the pumpkin, mix well and serve. Source: Adapted from Cocina Vegetariana Paso a Paso, Parragon books. Categories: Broccoli, Pumpkin, Recipes | Tags: balsamic vinegar, salad, side dish | Permalink. 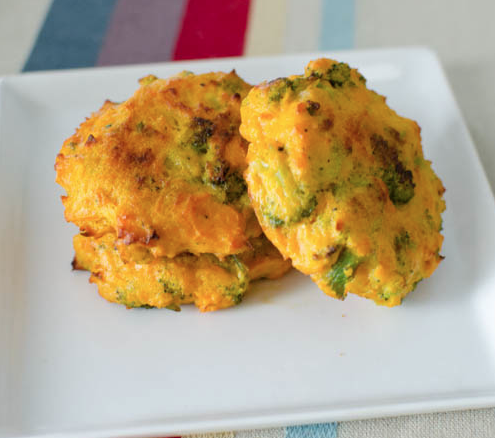 These are little tasty bundles of melted cheese and broccoli, that serve well as appetizers or side dishes. A perfect hit with children and adults! This recipe requires breadcrumb mix, if you would like to make it, you may find a recipe here; or you may buy a package. Cut the broccoli florets in half and blanch them. Set aside. In a medium bowl whisk the eggs, add the cup of breadcrumb mix, cheese and broccoli. Toss everything together. Refrigerate the mixture for about 1 hour. With clean hands form small balls (about 3cm) or patties (disc shape). Place on baking sheet in parchment paper and bake at 300° C for 30minutes. If you shaped them into patties, turn them over after 15minutes. Source: Adapted from Stacey Snacks. Categories: Broccoli, Recipes | Tags: appetizer, side dish | Permalink. We have found this recipe to provide an easy way of incorporating vegetables into a main course. 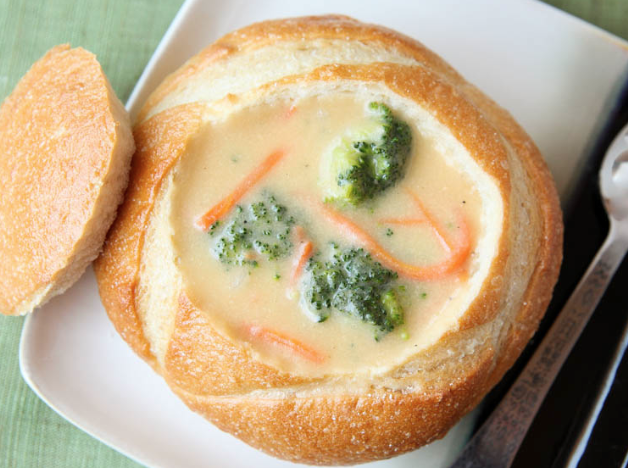 The vegetables in this dish, such as the broccoli, have a leading role and are not overshadowed by the sauce. We were inspired by Recipe Girl’s baked version, though we have simplified it by only cooking it. We have also made a few changes, for instance, we blanched the vegetables, to keep them a bright and bit crispy and used tagliatelle instead of spaghetti. Cut the broccoli florets into halves and blanch them. Peel the carrots, slice and blanch them. Cut the bell pepper into strips. Cut the tomatoes in a vertical sense into quarters and each of these into thirds. Or if you are using cherry tomatoes, then halve them. Prepare the tagliatelle according to the manufacturer’s instructions, and remove from the heat and strain when it is al dente. In the meanwhile, heat a pan and drizzle with olive oil. Mince the garlic cloves and stir them into the pan and cook until lightly golden. Add the vegetables and cook for about 2 minutes. 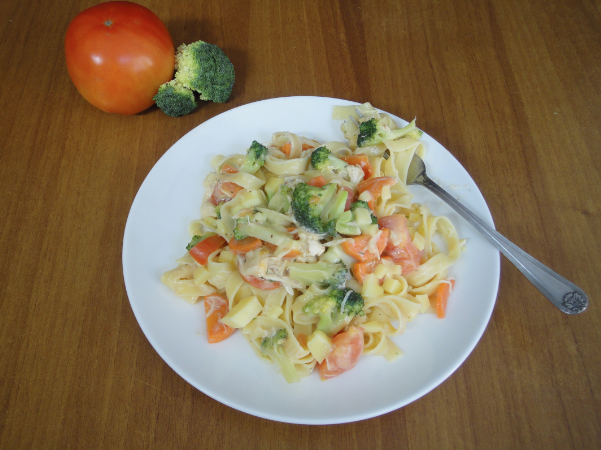 Shred the cooked chicken breasts, and put them into the pan; add the tagliatelle and toss everything together. Pour the white sauce and mix again until fully incorporated. Add salt to taste. Serve into the dishes and sprinkle with cheese. Source: adapted from Recipe Girl. Categories: Bell Pepper, Broccoli, Carrot, Recipes, Tomatoes | Tags: dinner, lunch, main course | Permalink.